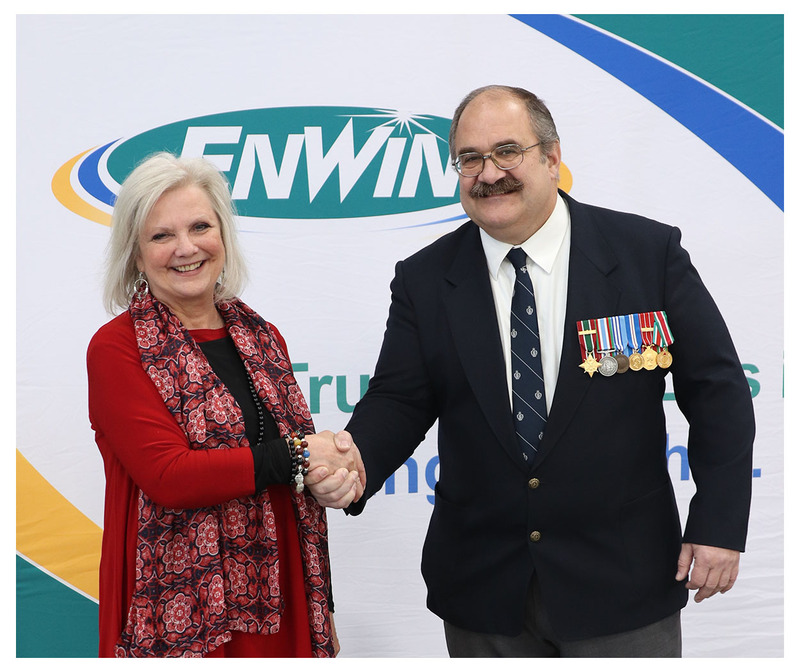 Windsor, ON: Earlier today, ENWIN presented post-secondary education scholarships to three members of The Windsor Regiment Association, an organization that supports returning and active soldiers from The Windsor Regiment of the Royal Canadian Armoured Corps (RCAC). Corporal Rebecca Momney, Corporal Brandon Badour and Corporal William Tate have returned from duty and are now enrolled in post-secondary education. Each received $500 for a total donation of $1,500. 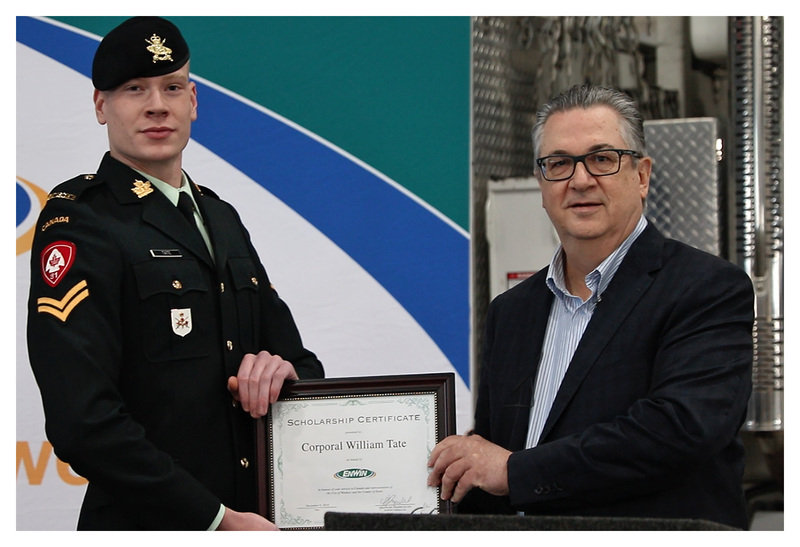 The Windsor Regiment Association post-secondary scholarship initiative was selected by the Community Support Committee as a Powerful Partnership. 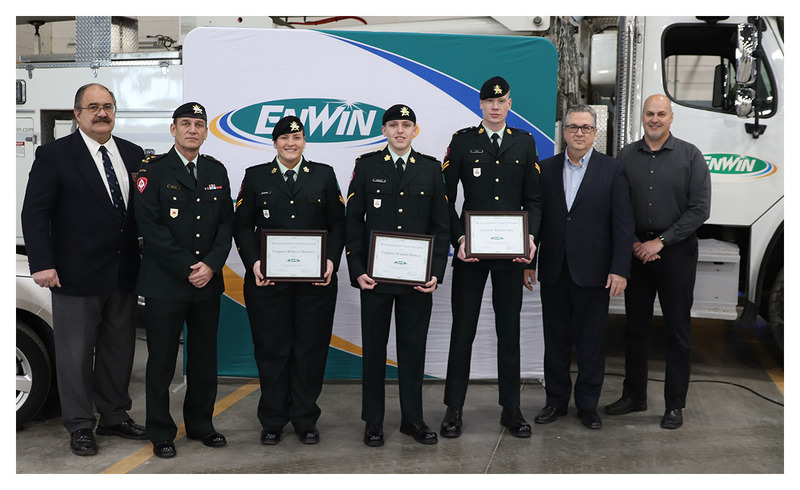 "Distribution utilities have had a long association with the military in times of need," said Jim Brown, Vice President of Hydro Operations for ENWIN, who presented the soldiers with scholarship certificates. "We're very happy to establish this partnership with the Regiment and to contribute towards post-secondary education for these deserving recipients." "We know that training and post-secondary education is the best way to ensure that these young people who have been deployed overseas are ready to meet any challenge they face when they return to life in Canada," remarked Retired Colonel John Celestino, President of the Windsor Regiment Association. "From the bottom of our hearts, thank you to ENWIN for supporting these young people." Windsor Regiment Commanding Officer Lieutenant-Colonel Nick Marukis was also in attendance at today's event. After the presentation, the group took part in a tour of the Hydro Operations Control Room.